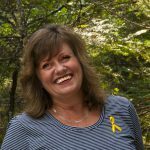 Leanne is MightyWrite’s lead business writer and story teller. Her goal is always to take clients beyond their expectations and innovate how their stories are told. To heck with all those New Year’s resolutions to reclaim the svelte form of days gone by. I’m making tacos! In my defense, the craving for the famous family recipe came after I’d done a hard workout tromping through snow well above my knees for about 4 km. Once home, I was hot, tired and hungry. I poured myself a much-deserved refreshment and debated whether I had the energy and the ingredients to forge ahead with homemade tacos – everything from scratch, including the unparalleled cornmeal shells. I considered this as evening arrived with a gentle blanket of snow, glistening against the deep dark winter night – darker here in the country without any of the noise of streetlights or other houses nearby. The setting was right. 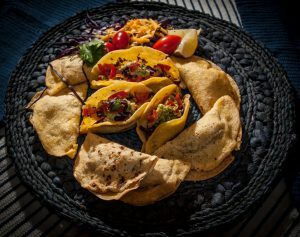 My mom and I, along with aunts, cousins and friends, would often embark on a taco-making frenzy on a late winter afternoon, usually a weekend, when there wasn’t a whole lot else to do in my old hometown of Pine Falls, Manitoba. That’s if you didn’t play hockey or want to hang out at the local watering hole. 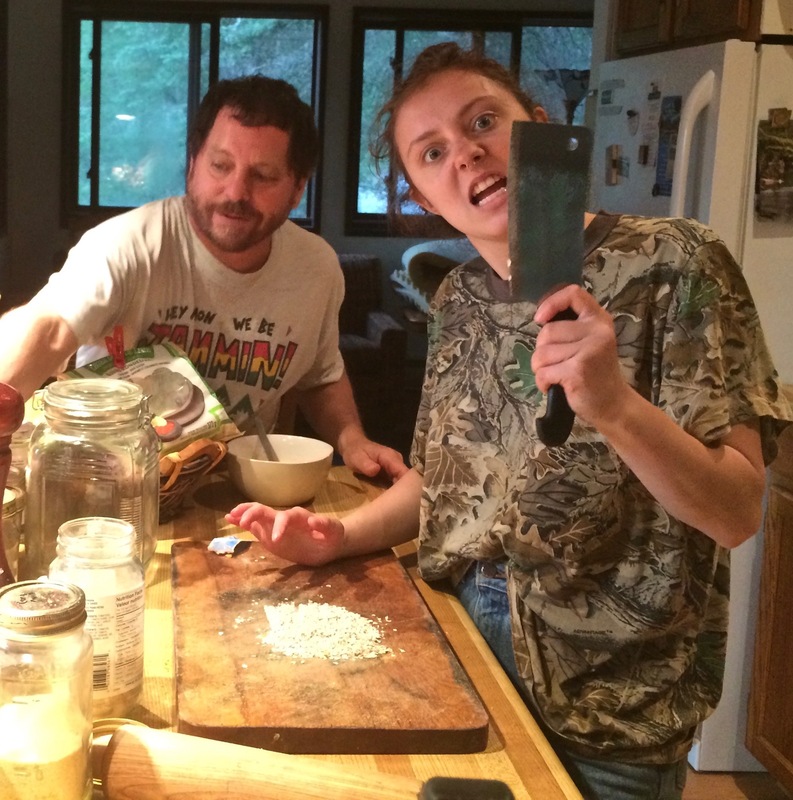 Many hilarious antics arose during all stages of the recipe preparation, cooking and devouring. I am not Spanish and have only been to Mexico twice. The authentic recipe came to town with a Mexican woman, Cathy Neal, who married a local. “We were eating tacos before anyone else in Canada!” my mother recalls. She adds that Mrs. Neal was as generous with that recipe as she was with the heaps of fun she brought into the community. 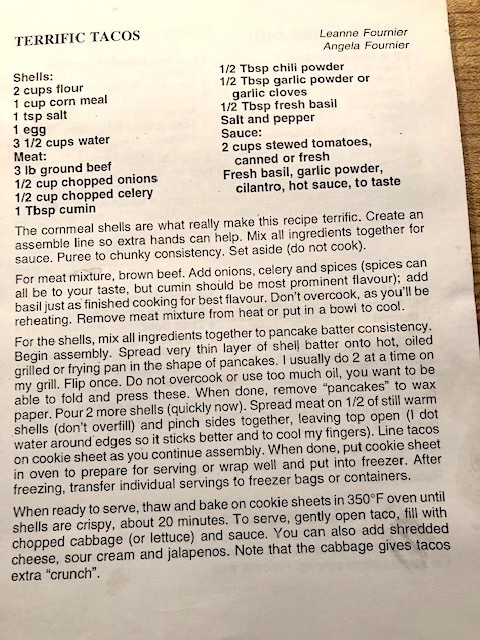 The reason the taco recipe made it into this story is because when I posted photos on Facebook as I prepared them, it unearthed a flood of comments – first from people from my old hometown who didn’t have the recipe and second, from those who did have it and had their own fond memories of its partaking. I refer to it as the “Famous Pine Falls Taco Recipe” because I knew it had a story of its own. I didn’t expect that story to run as deep or as far as it did. These conversations got me thinking about the tremendous impact that gathering to prepare and share food has had on my life. I’m sure that’s a story that many of us share. While we all just did what we did, research shows that sitting down for meals together can have lasting, positive effects on all aspects of physical and mental health. In writing this, I am fully aware that having that basic need met is a challenge for many and support organizations like Siloam Mission that are founded on the belief that hope begins with a meal. If this story moves you in any way, and you are able, think about donating to Siloam Mission or any organizations or groups in your community that are bringing people to the table in safety and hope. Many hands make light work (most of the time)! In my family, gathering to break bread (or tacos!) was how we came together in relative harmony, no matter what was going on in our lives. 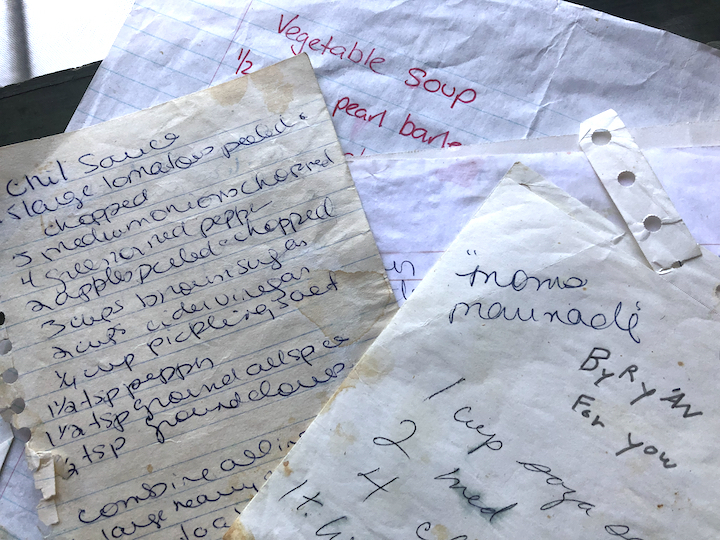 My mom was famous for her soups, roasts, casseroles, pies, cookies and various other recipes that had been passed down to her from my grandmother, whose mother passed them down to her, and so on. 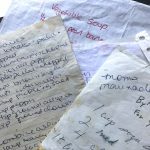 I was an adequate cook when I first got married, because I too had inherited some of these recipes, but really didn’t put many of them to work until our family grew. Then, the undeniable attraction of pausing at dusk to gather up, share – and often debate! – the events of the day was irresistible. One by one, I began collecting more of those ancestral food traditions, from both my mom and mother-in-law – trying, failing, trying again and eventually, mastering many of them (but not all!). And, as I attempted and failed and tried again, more people started to show up at our table. This included our children’s friends and then their boyfriends and girlfriends, our friends, and immediate and extended family. At some point, I was passed the torch, and the seasonal, family gatherings started happening more and more under my watch. Four at the table became six, then eight, then twelve and on and on as more people found their way, bringing their own contributions to the feast. I credit the strong women of our family who established these traditions and I know it isn’t the same in every family. I can still see the backside of one of my high school friends as she dug through our fridge whenever she was over. She loved my mom and my mom’s cooking. Our house was a haven for her in a difficult life. Tried and true recipes from the family archives. I consider as one of my greatest achievements the fact that I carried on this tradition and have lost count of the number of times I’ve fed a gang of people who showed up because they knew I was making their “favourite” wings, paella, spaghetti and meatballs, pizza, or yes of course, those tacos, plus many other “famous” recipes. As it turns out, most of those just mentioned are my own new contributions to our family’s store of food traditions. No one has been – or ever will be – turned away from my table as long as they show up with gratitude, respect and a good appetite! It’s a well-known fact that food brings people together. But just how tightly can vary depending on the people, places and palates. Some are just there for the food right? Others are there for the social connections and conversation. And then there are some, like me, who get more out of the food preparation than the food itself. Although I do really like to eat the food too! I have often wondered about those of us who love this “work” while others despise it. That’s what inspired this story – that gratitude of knowing that my love for cooking, the fact that it brings me solace and peace, is because of how it softened the hard edges of tougher times as I was growing up and in my adult life. I’ll never forget that wild rice soup that was delivered to our home, by one of my mom’s lifelong friends, when my grandfather died. Or the flawless turkey dinner that arrived shortly after grandma’s passing. Those are the deep lasting bonds that can be found – if you’re as lucky as I am – sharing food in the company of family, friends and community. Light snacks or accompaniments can satisfy hangry guests. Embrace diversity –Whether it’s culture, opinions, identities, food or dietary preferences, rather than seeing these as extra work to accommodate and entertain, I look at opening the door to all of them as a way to learn and expand the table. 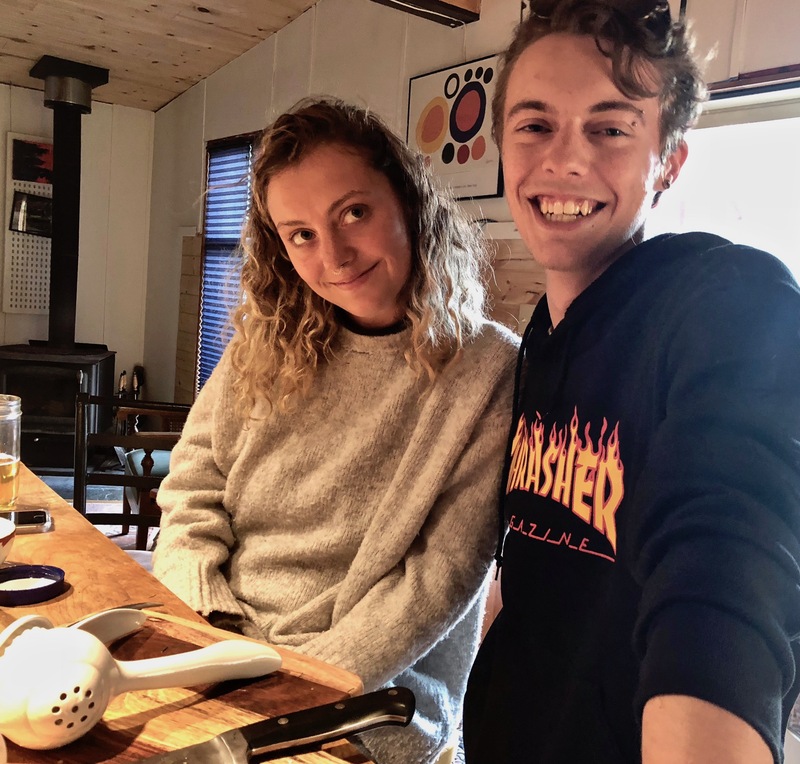 Welcome help – While it may upset your perfect “timing”, accepting help from those with less experience or others who may not share your ideal “vision” for the meal can lessen your burden but also sets the foundation for the tradition to go beyond that single repast. My mother must have groaned when I insisted (and failed) in my first attempts to get that taco batter just right. But look where her patience took us! With help before, during and after the meal, you’re less likely to resent the effort and do it all over again! All help is good help! Provide some instant gratification – Anything worth the effort, usually takes time. Stave off the impatient, starving crew with some appetizers that compliment but don’t ruin the meal. I usually avoid breads or heavy gluten of any kind and stop serving appetizers an hour or so before the main event. You want to minimize the risk of “hangry” guests but give yourself space to do your work! Foster connections – Whoever created kitchen islands is my hero. This is where people can gather, idle hands can pick up some of the tasks, stories are shared, and laughter erupts at the various goofs of cooks like me. By its design, the island allows those preparing the food to face their guests. This opens the door for so many great, memorable conversations. Consider all needs – In my household, this might sound something like “the vegans are coming!” As noted above, inviting those with preferences or dietary restrictions (aka gluten) is an opportunity to learn something new. I usually ask these guests to make suggestions, or even better, bring their own contribution! Set the tone – Being hospitable and welcoming means being aware of any sensitivities or issues that might be coming to the table. This goes beyond the food. For example, a person in recovery from an addiction should know they are safe and if having alcohol served is an issue for them, that should be respected as part of their invitation. Same if you’ve included someone who may be bringing some past hurts either directly or indirectly related to you or other guests. Taking a moment to acknowledge and welcome them personally can make all the difference. 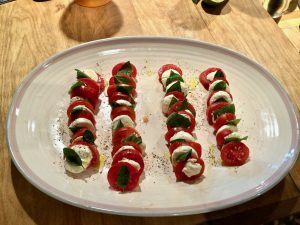 Forgive the latecomers – I like to serve my food hot, but what the heck – it’s mostly still great even if it’s consumed well past the time guests were asked to arrive. My rule is if you show up late, you’ll get a warm welcome but your food might be cold. Sit down – If the intention is to bring people together to “share a meal”, do what you can to have them all sit down at the same time – and that includes you! 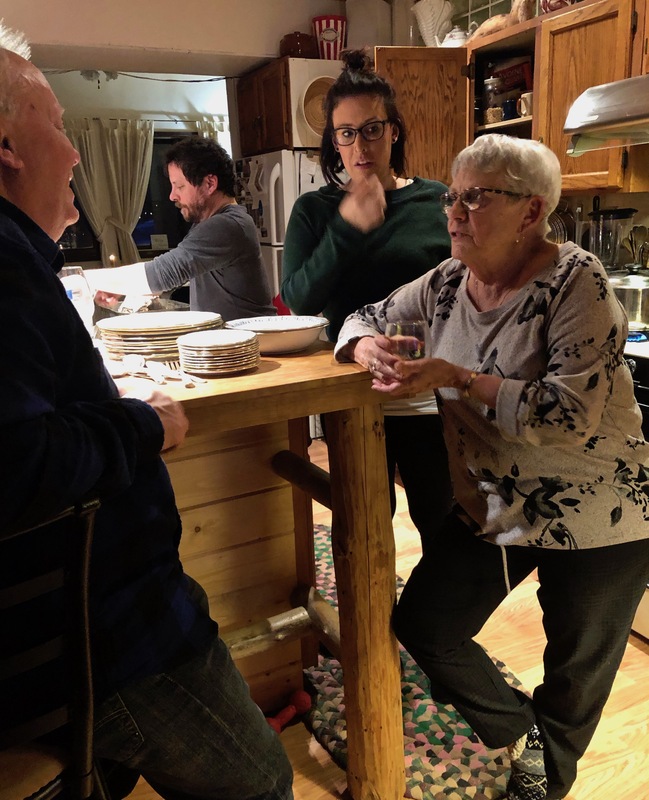 In my small house, this often means at a few different tables, but people are still face to face, interacting and enjoying both the food and social connections at the same pace. If it’s more casual with just finger foods, have spots where people can still get off their feet and congregate with others around coffee tables, couches, etc. Cool it with the clean up – While this has meant I’ve been left with all the dishes on more than one occasion, I avoid starting to load the dishwasher or fill the sink while people are still enjoying those important conversations and connections with one another. I’d rather let the evening continue and if I’ve thought of it, I may ask a few close friends or relatives to hang around afterward to help with clean-up. Perhaps my standards are low in this area, but dishes can always wait. Love how islands bring people together. Shown: Big bro, mom, niece and partner. Thank you for joining me on this journey down culinary lane. I’d love to hear about your food traditions or anything you do that brings people around the table in everyday and surprising ways. Please share them in the comments below. It may be a future story! If you like this story and are just dropping by, you can subscribe for the Mighty eNews. If you are subscriber but want to learn more about the power of stories and what we do, go HOME. It’s been adapted with details for a young audience as I once shared it for my kids’ elementary school cookbook (don’t mind the typos). You can definitely alter it for your taste and lifestyle. Lettuce and store-bought salsa work just fine! No hablo español (I don’t speak any Spanish…but will make an attempt) Buen provecho! Thanks my friend. We have enjoyed many wonderful meals together. Hope for many more!